Monsignor Fernando Ocáriz spent March 29 - 31 making a brief pastoral visit to Saragossa, Spain. With a translation of the homily he gave in the church of San Carlos, where Saint Josemaria was ordained in 1925. On Friday March 29th, the Prelate of Opus Dei began a pastoral visit to Saragossa, the city where Saint Josemaría prepared for the priesthood and lived from 1920 to 1927. 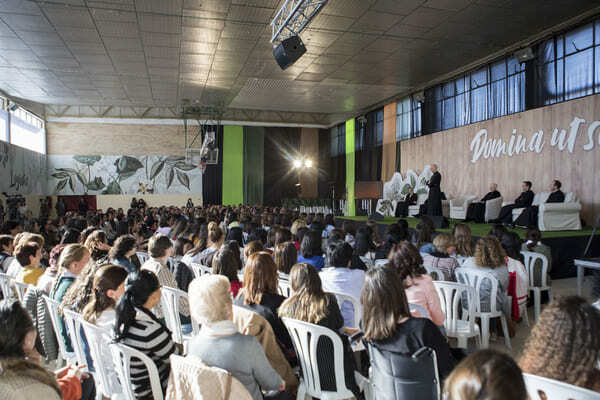 Arriving in the afternoon, Monsignor Ocáriz greeted members and cooperators of Opus Dei together with many young people and families. The Prelate went first to the Basilica of Our Lady of the Pillar, where he spent some time praying before this image of the Blessed Virgin Mary. He was invited to kiss the image and given a warm welcome by the penitentiary, Fr. Pedro José Gracia, who addressed some affectionate words to him before the people gathered there. 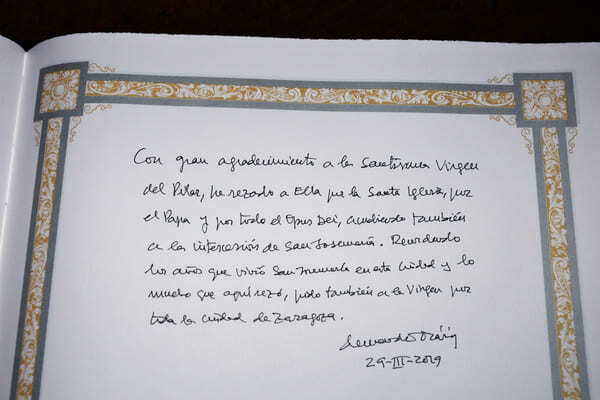 Monsignor Ocáriz also wrote a dedicatory message in the Basilica’s guestbook, explaining the reason for his trip to Saragossa: "With immense gratitude to Our Lady of the Pillar, I have prayed for the Holy Church, for the Pope and for everyone in Opus Dei, having recourse also to Saint Josemaría’s intercession. Remembering the years that Saint Josemaría lived in this city and how much he prayed here, I also pray to Our Lady for everyone in Saragossa." On finishing, Monsignor Ocáriz went to greet the archbishop of the city, Archbishop Vicente Jiménez, at his residence. On Saturday, Monsignor Ocáriz concelebrated Mass [read the entire homily] in the church of the old seminary of San Carlos, where Saint Josemaría was ordained a priest on March 28, 1925. The Prelate thanked Fr. Carlos Palomero for having recently placed a plaque in memory of the founder of Opus Dei, recalling that it was there that the seed of his spiritual life was nurtured. Almost five hundred people attended the Mass, during which the Prelate recalled the many hours Saint Josemaria spent in prayer there before the Blessed Sacrament. He reminded those present of the importance of becoming "souls of the Eucharist, souls of prayer" in their own lives, following the founder of Opus Dei's example. The hymn to Our Lady of the Pillar, sung by the choir of the Basilica, concluded a very moving ceremony. “Jesus was counter-cultural. The apostles were counter-cultural"
In the afternoon, the Prelate met with several groups of young people from Saragossa and the surrounding areas. He asked them to pray for Pope Francis, and specifically his trip to Morocco, and he also encouraged them to take advantage of the Christian formation they receive through Opus Dei to identify themselves with Christ, to be cheerful and consistent with their faith, even when it involves going against the current. "Our Lord wants us to be happy. Our Lord is concerned about each of us personally. He has a plan, a hope for everyone. He wants us to be happy," said Monsignor Ocáriz. The secret of that happiness, he said, is service. "Serving is what makes people happy. Selfishness doesn't lead to happiness. Saint Josemaría said that sadness is the end product of selfishness; in contrast, to serve, to give oneself to others, produces great joy." The students had a few surprises in store for Monsignor Ocáriz, including a video greeting from people from this part of Spain who now live in different countries around the world and who could not be present during the visit. The video included messages from places such as the Ivory Coast, Normandy, Japan, Jerusalem and Cambridge. The Prelate encouraged them to live joyfully even when they make mistakes and have defects, "because God loves us as we are.” He also told them, “Jesus was counter-cultural. The apostles were counter-cultural, and so are all those who have wanted to be faithful to our Lord. Counter-cultural, not through our own strength but because our Lord is with us." Mariu, dean at Peñalba residence, asked the Prelate how to deepen in her faith. Monsignor Ocáriz reminded her that faith is a gift from God, and that "we all experience some darkness in our faith. The apostles feel their need for more faith and they ask our Lord for it. When you feel your faith is a bit weak, you can pray: Lord, increase my faith." Steven, a fourth year Law student, spoke about the influence the World Youth Day in Krakow has had on his life, while Saif, a Muslim from Morocco, was thankful for the formation given through Opus Dei to the volunteers who help him through a social project called International Cooperation. Javier, who suffers from a disability that has made him permanently dependent on others, was helped by his brother Nacho to express gratitude for the affection he receives at the Jumara Club, "my second family," and asked what he could do in return. The Father told him: "pray very much, offer up your difficulties, which our Lord transforms into something of great value. He wants you very close to the Cross so you can be very effective. May God bless you." The young people also gave the Prelate a drawing with "ten dreams for the next ten years" until the centennial of Opus Dei. Monsignor Ocáriz returned it to them with this dedication, using words of Saint Josemaría: "Dream and your dreams will fall short." Together with the drawing was a donation to help the people in Venezuela. Sunday 31: "The real source of our joy"
Monsignor Ocáriz continued meeting with various groups of people on Sunday. He spoke to them about the importance of always being joyful, and regaining one’s interior freedom to love and to do good. The Prelate also greeted the directive committees of two secondary schools: Montearagón (where Sunday’s get-togethers were held) and Sansueña. He also spent time with representatives from several agricultural training schools and associations of parents, chatting with a number of families. At the end of a get-together, one family approached Monsignor Ocáriz to give him a local delicacy: a ham. 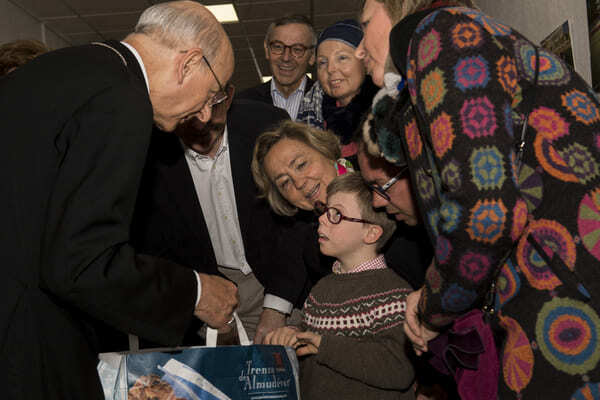 Félix, who has Down syndrome, gave the Prelate a hug and a gift from his family: a box with a well-known Aragonese candy. 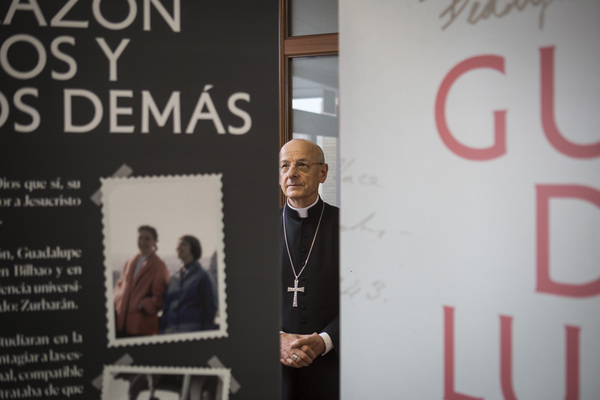 In the school’s main entrance hall, Monsignor Ocáriz was able to view the new exhibition about Guadalupe Ortiz de Landázuri. Some teachers gave him a booklet that was prepared for a chemistry contest organized in honor of the future blessed, and they invited him to solve some of the problems in the book. In the get-togethers, the Prelate shared his joy about the previous day’s experience celebrating Mass in the place where Saint Josemaria was ordained a priest. He recalled how the founder of Opus Dei repeated the same simple prayer during those years: “Domina ut sit!” (“My Lady, may it be!”) and “Domine ut videam!” (“Lord, that I might see!”). Without knowing what God wanted from him, Saint Josemaria “put his future and doubts in God's hands." "We should have the desire and firm disposition to foster the same availability that Saint Josemaría had, within our personal limits, telling God: Lord, I’m here for whatever you want," said Monsignor Ocáriz, who recalled that the Christian’s only strength – and the most important thing for any enterprise – is prayer. In the afternoon, Monsignor Ocáriz met with more faithful of the Prelature as well as priests of the Priestly Society of the Holy Cross. The Prelate once again asked for prayers for the Pope and, in response to a question from a diocesan priest from Saragossa, he said that "the Church is above all Jesus Christ, with all His salvific power." He also asked everyone to pray for priestly vocations, "without being afraid to suggest to someone the possibility of a vocation," and keeping in mind that "without the Eucharist there is no Church, and without priests there is no Eucharist." The desire to help further the work of evangelization was reflected in several questions. The Prelate encouraged those present to be a very good friend to their friends, because "friendship is a form of love that entails the desire for the other person’s good. We love people because we love Christ." In the afternoon, Monsignor Ocáriz visited the Sansueña school, where he was received by the school board. The Prelate blessed the Early Childhood Education facilities, wrote a dedication and chatted with the heads of associations of parents. "We need to always be joyful"
The Prelate took advantage of the liturgical celebration of “Laetare Sunday” to talk once more about the need to live joyfully. "All our life has to be imbued with joy, also when a time of penance comes, when there is cause for suffering, and when things are difficult. An expression of Saint Josemaría comes to mind: we shouldn’t think that the only work we can do joyfully is what we find pleasing. We can and we should do everything with joy," he said. "We should never be discouraged by difficulties. Neither because of difficulties we find in ourselves, nor because of the environment at work or wherever we are. We have God with us. We need to always be joyful, no matter what happens. Because despite our nothingness, our joy is not based on being supermen or superwomen. It’s not based on knowing we are doing things right, but on the fact that God loves us madly. That is the real source of our joy." Although Christians have to go against the current, the Prelate pointed out that "this is normal." He also recalled how Bishop Javier Echevarría often said: "How many good people there are in the world! There is also a lot of ignorance, but many good people are waiting for us." Isabel, a registrar in Saragossa and a mother, shared her concerns about formation. The Prelate encouraged her to take care of her spiritual reading and to invest time in her formation, which he called "the foundation for everything else" and which consists in identifying oneself with Christ through prayer and the Eucharist. Responding to a question by Juan Luis, a marketing professional, the Prelate spoke about hope and recalled how Saint Josemaría used to point out that nothing is ever lost if we do things with an upright intention. Monsignor Ocáriz said that Pope Francis has great hopes that Opus Dei will reach "the peripheries of the immense middle classes of society, which is the majority of people," and told those present to never be discouraged. 2. What does the “Gospel according to Mary (Magdalene)” say?